Have you been appointed as an Event Director or are you part of an Event Organising Committee? 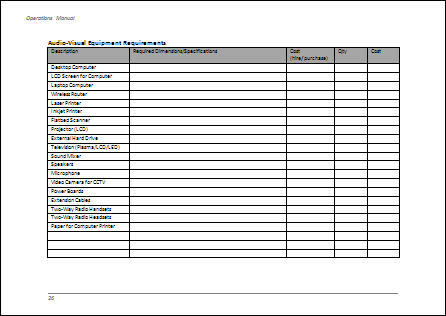 Do you need help putting together a comprehensive Event Plan? Are you worried about the extensive hours it will take to draft an Event Plan? Here is a product that will truly be an asset of great value to you and save hours of work! For your immediate download, here is a 43 page fully editable Event Operations Manual template that has been created for you in Microsoft Word. The intent of this resource is to give you a head start in developing a 1st class resource for planning, organising and managing your event, no matter how big or small. 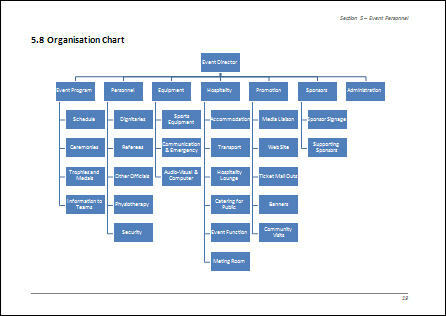 You can make changes to suit the specifics of your event and insert your own company logo and other organisational information so that the manual will appear to be developed purely by you. The manual will save hours and hours of time and assist you to quickly discover the many tasks that need to be completed to ensure the success of your event. The purpose of the guide to event management is not to provide you with a complete solution but simply to save you many hours of work. The manual outlines the typical tasks involved in putting together a major event including many items that could be easily overlooked until the last minute. Perhaps the greatest benefit of this manual is that it will accelerate your ability to recruit the Event Management team and begin allocating tasks. Instead of taking weeks of meetings to discover all the smaller tasks, you will be able to start delegating tasks straight-away. 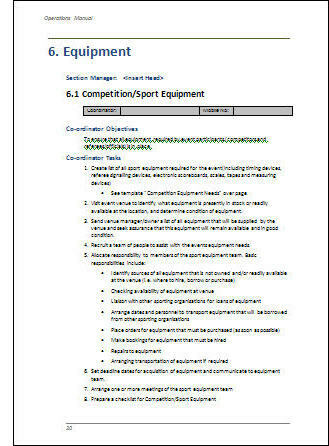 Furthermore, this resource contains a position description template and you will be able to create position descriptions by copying and pasting from relevant pages in the manual. Caution: Whilst this resource provides a great deal of information, it should not be considered a complete package for your event. 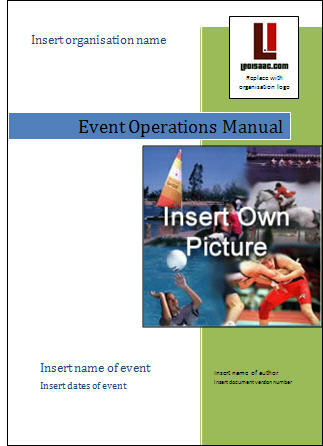 You will still need to work with your team to edit the Operations Manual and make it specific for your event. The cost of this key resource is $15.00, much less than an hour's work. It will save you 10 times the amount of work and get you much nearer where you want to be with your event.